These are just what they sound like, solderless pin headers! Great for throwing together a quick prototype or if you just don't feel like warming up the soldering iron to attach a few pins. These 0.1" spaced header pins simply snap into place and create a good solid electrical connection. Sold in 10-pin strips. They can be snapped or cut to the desired number of pins. 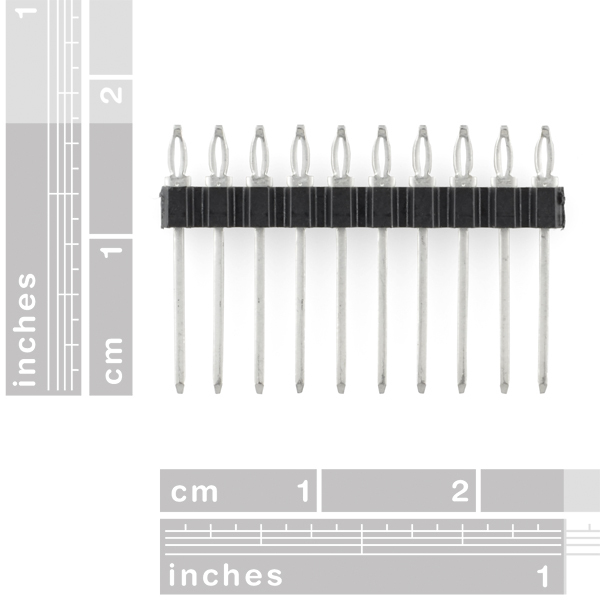 I bought a bunch of these and I cannot for the life of me get these headers installed onto a circuit board. They just won't get in even if I try to force them onto a PCB. Anyone have tips on how to make these work? I wanted to use them for an ICD header - I found that if I took my Panavise and used the soft pad for the back and the hard paddle for the pins, I could very carefully press the header into the board. I too am worried about what kind of scarring of the through hole plating might occur though. These are actually "Press Fit" headers. The loop part goes in the hole. They are meant to be permanent; removing them will likely wreck the through-plating in your PTH. They "simply snap into place" only with the proper (perfect) hole size/spacing. Otherwise you will need a press die and a vise, a special tool, or something improvised and a lot of care. They can be soldered for better electrical/mechanical connection, but if you're doing that anyway, use a plain header. Industrially, they are used to add a header to a PCB without using a soldering process likely to desolder previously installed components (e.g. with TH components opposite side). For our purposes, it's good to add a header to a board that we don't want to solder to. I'd like to echo the other comments - I bought these because I don't know how to solder, but so far it looks like installing them is more difficult than learning to solder. I don't have a panavise that another commenter mentioned. Is there a way to install them using commonly available tools? I bought a couple of these as I wanted to hook up the short side to the XBee explorer regulated and the longer side to the breadboard so I did not have to solder the Breakaway headers to XBee explorer. But just can't seem to get them through the pcb of the XBee explorer. The short side don't seem that flexible enough to get through the pcb. Anyone else tried something similar? How is everyone using these headers? 1. How well does a single pin hold? 2. How many insertions/removals can they handle? 3. Do they cause damage to the plating on the PCB? Those are $0.36 each, and $1.50 for 10 is less than half that cost. I used these to reprogram SF's Nordic FOB. They tore up the holes in the PCB. They can only be used once IMO. They get squished out of shape. I think a single pin wouldn't hold well. I think it is less destructive to the holes to solder some thin wire to them. These pins are not for temporary connections. There are probably times these pins work well if the PCB if strong and the pins are permanently installed without much stress to the pins. They probably work better when several rows are placed side to side. Hehe... happens to all of us. You could even break one off then slide off the plastic, and voila! A needle in a pinch! I hope SFE gets more. These work great if you use needle-nose pliers to crimp the springs so the pins go in/out easily. @disabelle I agree that female ones would be great. I could wire items to an Ardiuno with superior laziness. Don't fit? Don't fret! I took my Sparkfun-branded needle nose pliers and gave the head of each pin a very delicate squeeze until they all fit perfectly, and were nice and snug too! So nice not having to solder them, it gets to be a pain after awhile, when you've got a project that needs to get done, but have to stop periodically to solder on pins to the new components you buy! I bought these because I wanted to experiment with a pair of Wixels, and wanted to avoid having to solder in the standard headers Pololu provides. The through holes seemed pretty loose, so an ordinary header would not make good contact on its own without solder, so this product looked ideal. Unfortunately now that I have them here, I see that I simply can't push even a few of these pins through the Wixel through holes, without applying an uncomfortable amount of pressure. The wixels are almost $20, so I'm not going to press further and risk ruining them. I even tried pushing these headers into an experimenter board first, hoping their firmly held position might make it easier to rock the wixel board back and fourth and eventually get the expansion pins to fully seat. Doing so barely allowed me to get the wixel board to hold in place. But they are still not even going fully through the holes from one side of the board to the other. I guess I can try modifying the product, but if I'm going to do that I might as start with ordinary headers, coating one side with a thin layer of solder to make a better force fit. In any case, I'm sure they work fine with some product the designer had in mind, but this is my experience. I want to use an LCD component on a motherboard. I need to solder header pins (16 of them) in the LCD so I can use it on a breadboard with an Arduino. I do not want to do any soldering. Will these Solderless Headers work for my scenario? The press fit does NOT work with the standard hole (except with one pin and a lot of force. I use a single edge razor as a spacer in the eye and needle nose pliers to squeeze the opening a bit, then it fits - I've used these to hold a GPS breakout board. If I don't use the razor and squeeze it won't hold. Everything you would want to know is here - the company is mentioned in the datasheet. These are designed to be press fit - as the name implies. I am thinking of designing a widget board thingy where a 40pin cable goes from a standard terasic FPGA dev board to a daughterboard you could easily attach some of the sparkfun things to. Now if I set some of these up in the peripheral board, do you think an end user could take of and put on different color text-lcds? or would the fit be too loose. Can these be used to attach a Arduino Shield to the Uno? As long as the shield's holes are plated (All Sparkfun shields are), then yes. Don't you need a plated barrel to use these without soldering? Buy some silver print and coat the hole. They're solderless in that you can stick a wire into the hole at the top and just E-Tape it in or something. No, you stick this is a plated hole in a PCB. Wire insertion is an interesting possibility, but a purely secondary use case. Yes, plating needed. You might need to make a special press die, too, depending upon the dimensions of your board. I had to do that last year for a PC/104 press-fit header. There's a tool available but for like two grand, so we just used a drill press to make the 104 holes in an aluminum block, and squeezed them through in a vise. You would need tight tolerances on the holes, which would have to be precisely deep so they all bottom out at the same time with this. I've used a similar type of pin before. They tend to be a bit loose. I'm glad to see you guys are carrying these though. These might be useful as temporary programming headers. 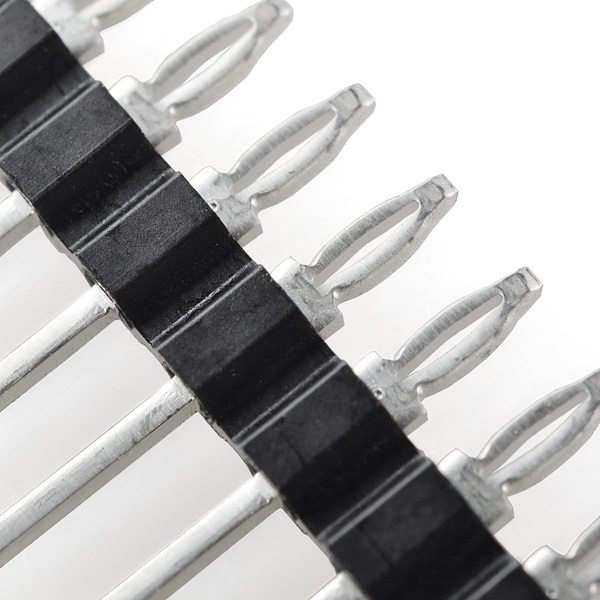 These particular solderless pins make an extremely snug fit, so much that they are just as secure as soldered pins. I tried putting them in by hand, but that proved to be impossible. Using pliers and a bit of force, I was able to rock them back and forth by squeezing the plastic sides. Any other orientation, and you end up covering up the through hole with the other end of the pliers. These probably are not the best for temporary headers. I use these solder less headers to connect remote sensors to a PCBA. 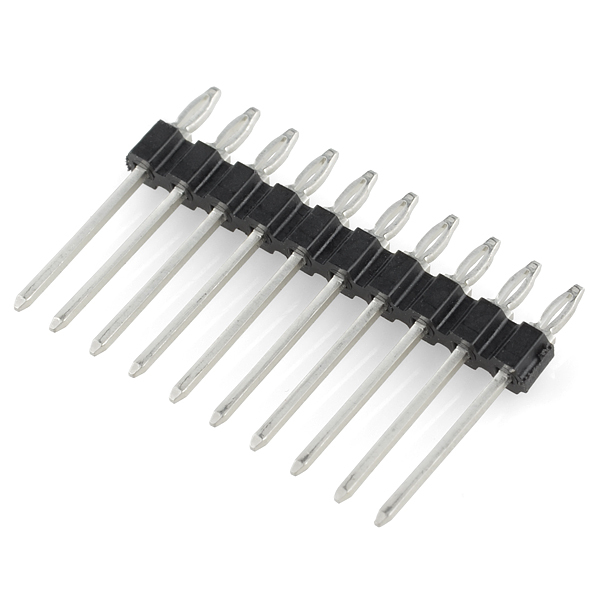 Using them eliminates making a very sensitive solder connection.